The White Company have recently launched a new skincare range. Created in partnership with global skincare experts DECIEM, the range consists of 6 products, designed to help transform the look of your complexion, no matter your age. 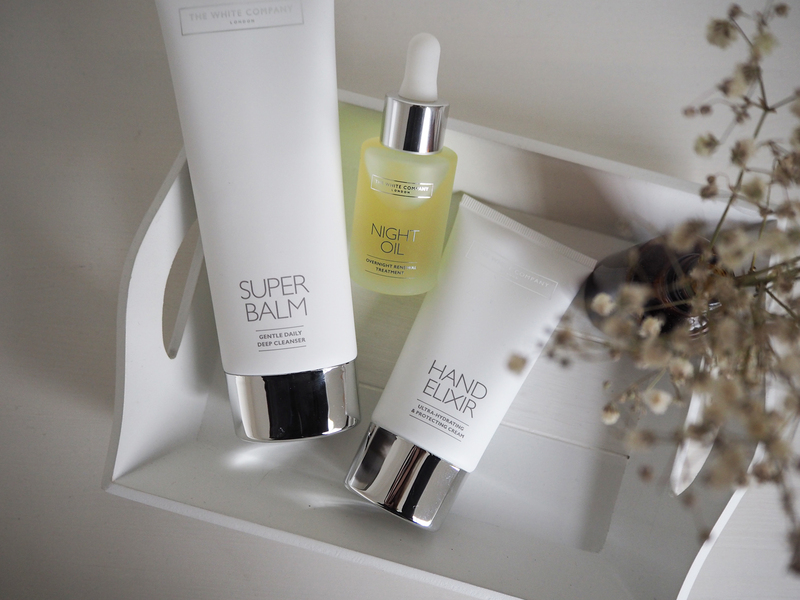 Products include brightening eye serum, skin perfecting moisturiser and multi-depth concentrate, plus the cleanser, hand cream and night oil pictured above. I chose these 3 beauty essentials to review, because each one serves a different purpose, but is something I will use every day. Particularly the hand cream. After a long and cold few months, I’m looking forward to the warmer climates of spring. My hands have really suffered this winter, being very dry and chapped. I’ve used a variety of hand creams to try and help soothe the skin, but nothing has fully tackled the problem. The White Company’s Hand Elixir is more of a lotion than a cream, but is so intense that you only need a small pea sized amount. Once fully massaged in, my hands are left feeling silky smooth, and the effect lasts for hours. I no longer need to continuously re-apply hand cream. Instead, I use The White Company’s product sparingly and only a couple of times a day. I will most definitely be investing in this product again, but I’m hoping this 60ml tube will last a while. Another product I couldn’t wait to try was the Super Balm Gentle Daily Deep Cleanser. Subtly scented with lemon, this cleanser smells amazing. It also massages into the face easily and removes all of my make-up, including my mascara. I have a cloth that I dampen with warm water to remove the cleanser, but The White Company also sell a set of 3 face cloths. The third product I was really excited to try, is the night oil, designed to give an overnight treatment to the skin. I apply a couple of drops to my face and neck after cleansing, before I get into bed, and allow it to work it’s magic overnight. This night oil product includes a mix of Amazonian oils, anti-oxidants and poppy-flower extract. The Amazonian oils are designed to deep hydrate the skin and I certainly think it’s helped improve the appearance of my skin in the morning. I’ve found recently that my skin has been very dry around the neck area, probably from all of the high neck tops and jumpers I’ve been wear. So this night oil has been great at helping soothe this area. I also find that it really relaxes me as I get into bed and go to sleep. I’m not sure if it’s the smell, the texture or the fact I massage it in, but I find it extremely relaxing. It’s such a nice feeling. I also find that the oil absorbs into the skin quickly, which is great for me as I like to sleep either on my front or side, with my face snuggled into my pillow. At first I was trying to fall asleep on my bank, in case any oil came off onto my pillow, but actually it absorbs quickly and I’ve not found it to stain my pillow. Overall I’m really pleased with each product. It’s probably too soon to see any true effects from the cleanser and night oil, but they definitely feel amazing on the skin. The hand cream is really fantastic and it makes my hands feel luxuriously smooth. The packaging is also beautiful. I love The White Company’s branding and they’ve continued their signature look throughout their skincare range. From the tissue paper, to the boxes, to the tubes and bottles themselves. They make the perfect addition to my white tiled bathroom. They’re almost too pretty to use!